This walk: 2013-10-30. Houndtor, local hunt, deserted medieval village, drying barns, kilns, ovens, longhouses, slotted gate posts, clapper bridge, Becka Brook, Ilsington/Manaton boundary stone, Leighon, pumpkins, camping barn. Inscription in memory of Keith Chudleigh. View of Houndtor from the car park, SX 742 789,elevation 414 metres ( 1358 feet). The local hunt, coming our way. A general view across the old settlement, established in the 1200s and abandoned 150-200 years later. 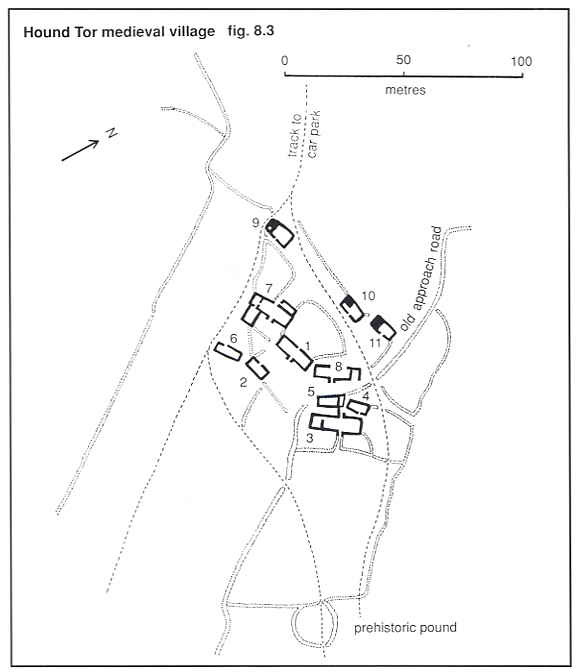 The settlement is described in J. Butler (1991), Dartmoor Atlas of Antiquities I, The East. 8.7 Houndtor medieval village, pages 54-56. The village was probably referred to in the Domesday Book (1086) when it belonged to Tavistock Abbey. Looking uphill, showing an annex beyond and on the left. Fig. 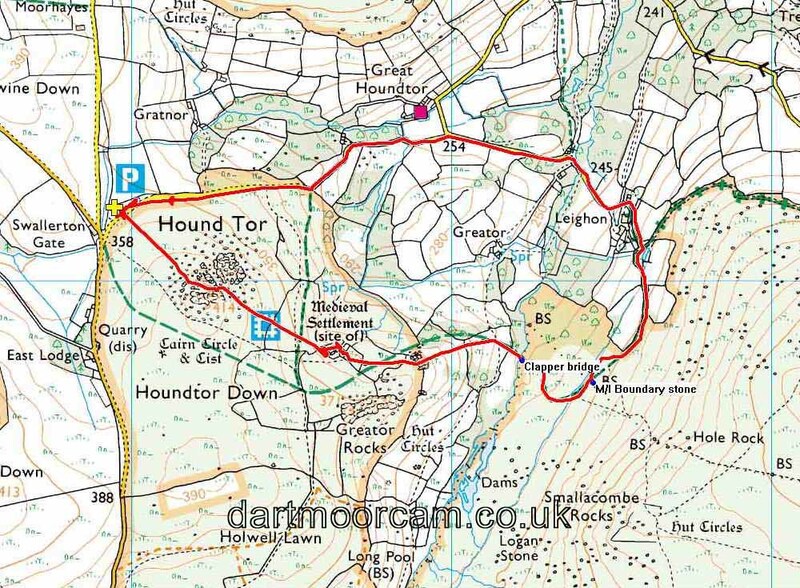 8.3 showing Hound Tor medieval village from J. Butler Dartmoor Atlas of Antiquities I (1991) 8.7 (page 55). The first drying barn pictured above is building 9 in this map; the longhouse is building 7. A pair of slotted gateposts passed just before reaching Becka brook. Photos: Liz Miall. As previous photograph, looking back. Tree roots exposed beside the path. Un-named set bound-stone, at SX 75445 78682, on the Ilsington/Manaton parish boundary. It has feather and tare marks so is post-1800 - several spare stones were cut in 1835. It lies between named stones the Hole Stone (SX 7565 7850) and the Horseshoe Stone (SX 7525 7815). It is, in fact, a spare stone that did not appear on 1835 or 1853 surveys or the original list of boundstones of 1879, although it is pencilled in on this list as "Stone marked "IM". Source: Dave Brewer (2002) Dartmoor Boundary Markers, Halsgrove, p. 95. There is, in the central area of this photograph, a crossed I denoting Ilsington. A 'crossed I' bears three cross strokes with one being halfway between the top and bottom of the letter. The rendered tower of St. Winifred's Church at Manaton. A multi-stemmed sycamore tree on the hedge beside the path, covering a large stone. "Look, Liz, a slotted gatepost!" - made of wood. Fencepost being enveloped by a tree. A mass of "gone over" fungi. Distance - 4.86 km / 3.02 miles.